How often have you had to listen to four or five (or more) voicemail messages before getting to the message you really want, or need, to hear? With iOS 8, the iPhone’s clever visual voicemail presents a list of your voicemail messages in the order in which calls were received. But you need not listen to those messages in order. 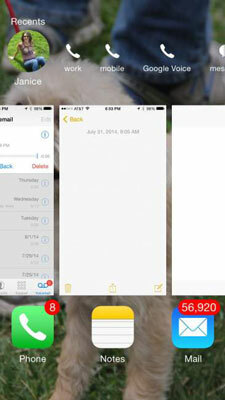 A red circular badge showing the number of pending messages awaiting your attention appears above the Phone icon on the Home screen or above the Voicemail icon in the Phone app. The tally, if it appears over the Phone icon on the Home screen, may include recent missed calls as well as voicemail messages. You may also see a message alert on the iPhone display that shows the name of the caller and the word voicemail. You can tap to listen, or close the alert and listen later. You’ll also be notified in Notification Center, where you can swipe to return the call. Whatever draws you in, tap that Voicemail icon to display the list of voicemails. You see the caller’s phone number (assuming this info is known through Caller ID) and, in some cases, his or her name. Or you see the words Unknown or Private Caller. The beauty of all this is that you can ignore (or at least put off listening to) certain messages. A blue dot next to a name or number signifies that you haven’t heard the message yet. To play back a voicemail, tap the name or number in question. Then tap the tiny play/pause icon that shows up to the left. Tap to pause the message; tap again to resume. Tap Speaker if you want to hear the message through the iPhone’s speakerphone. Tap Call Back to immediately dial the person’s number, or tap Delete to remove the voicemail from the list. Tap the i-in-a-circle next to a caller’s name or number to bring up any contact info on the person or to add the caller to your contacts. iOS 8 has an additional shortcut for making a call. Double-tap the Home button to display the multitasking screen. You’ll see circular thumbnail pictures representing your phone favorites, as well as the people with whom you’ve recently been in touch. Tap the circle for the person you want to call, and then tap the telephone icon next to the number you want to dial (home, work, mobile, and so on). With this approach, you don’t have to visit the Phone app to make a call. The scrubber bar shows you the length of the message and the tiny playhead along the bar shows how much of the message you’ve heard. If you hate when callers ramble on forever, drag the playhead to rapidly advance through a message. Perhaps more importantly, if you miss something, you can replay that segment. Returning a call is as simple as tapping Call Back. If the caller’s number is unknown, Call Back appears dimmed. And you can delete a voicemail by pressing Delete. If you have no phone service, you’ll see a message that says Visual Voicemail is currently unavailable. 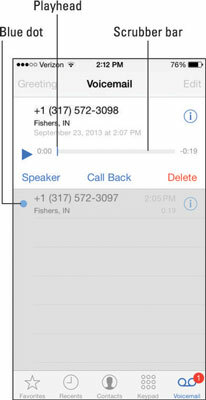 You can listen to your iPhone voicemail from another phone. 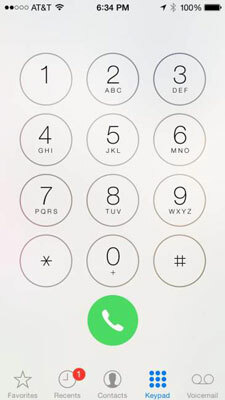 Just dial your iPhone number and, while the greeting plays, enter your voicemail password. You can set up such a password from the Home screen by tapping Settings→Phone→Change Voicemail Password. You’ll be asked to enter your current voicemail password, if you have one. If you have a password, enter it and then tap Done.